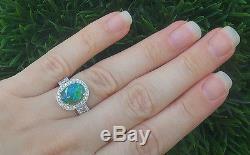 Immaculate SHOWROOM Condition - Tremendous Size & Dazzling 100% Natural Play of Color, GIA Certified UNTREATED 3.34 Carat Genuine Australian Black Opal & Diamond Cocktail Ring. This one of a kind collector's grade opal specimen is a spectacular example of an extra fine quality Lightning Ridge mined Australian Opal with an extraordinary play of color found in the finest of Lightening Ridge specimens. This world class estate ring features a genuine 2.30 carat (exact carat weight) Opal surrounded by a generous 1.04 carats of fine quality near flawless to eye clean VS2-SI1 clarity near colorless G color round brilliant & princess accent diamonds. In keeping with the exceptional quality of the opal and diamonds, the setting is heavy solid 14k white & yellow gold with elegance and grace that will draw attention to anyone who wears it. 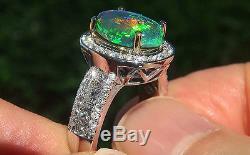 GIA Certified 3.34 ct UNTREATED Natural Black Australian Opal & Diamond 14k White & Yellow Gold Estate Ring. PRIME "Vivid EXOTIC Play of Color" Lightning Ridge - Top Grade AAA+ Gem "SEE VIDEO". HERE IS HOW THE COLLECTION CAME TO US. 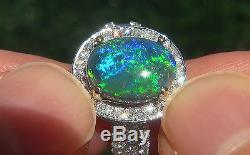 The "Jaw Dropping" Australian Opal measures 11.37 mm x 8.35 mm x 3.71 mm with the highly sought after EXOTIC Dark Gray Base Color Displaying a "Rich" Play of Color and an Oval Cabochon Cut weighing a JUMBO 2.30 carats (exact carat weight). There are also 68 natural untreated accent diamonds totaling an additional 1.04 carats (60 round brilliant & 8 princess) set with the Australian Opal in a classic style. These "Perfectly Clear" diamonds are graded at Near Flawless to Eye Clean "VS2-SI1" Clarity with NEAR COLORLESS "G" Color so you can be assured of the OUTSTANDING quality, excellent brilliance, flash, sparkle & fire. The diamonds were also evaluated by GIA and a Diamond Assurance Report is included confirming the authenticity of the diamonds. The ring measures 14.80 mm x 13.25 mm at the head and sits up 8.65 mm off the finger. For more details, please continue reading and see both gemological reports PLUS the high resolution photos below. This is an exquisitely crafted "one-of-a-kind" Collectors Grade world class estate ring. It offers a gorgeous design with detailed craftsmanship adding to the amazing style. The unique "TOP GEM" ring was made at the hands of a true jewelry master craftsman. 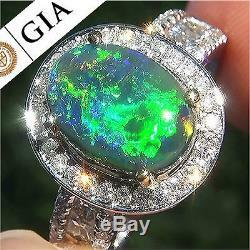 A unique chance to own a very rare top quality opal. 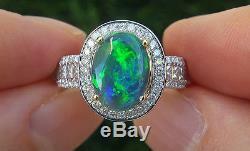 All of the beautiful gemstones are 100% genuine totaling a very substantial 3.34 carats and the ring is a U. The total ring weighs a HEAVY strong & sturdy 6.69 grams and is constructed of solid 14k White & Yellow Gold with exceptional PRIME QUALITY natural gems. Do not miss this opportunity as it is very difficult to obtain elsewhere. The IMMACULATE beauty is guaranteed authentic and has been professionally tested, CERTIFIED, cleaned and polished it is barely discernible from new and is in absolute SHOWROOM CONDITION. Get it while you can! This Highly Collectable "INVESTMENT GRADE" ring comes to us from a consignor who must sell a lifetime fine jewelry collection due to a court ordered divorce settlement. Meet our consignor & learn more about the collection in the second video above. So don't miss out on your chance to own this truly important heirloom treasure. LARGE Size EXOTIC Play of Color - UNTREATED Translucent Clarity Natural Australian Opals are considered among the rarest of opals....... Included with the item are both GIA Reports and a Certified Jewelry Report documenting the authenticity, quality and characteristics of the ring..... We hope you take advantage of this extraordinary item and rare opportunity to own a ULTRA High End - UNHEATED & UNTREATED - "INVESTMENT GRADE" - TOP GEM - GIA CERTIFIED - Natural "Lightning Ridge" Australian Opal & Diamond Engagement - Anniversary - Cocktail Ring below retail prices. Our gemologist also tested and verified every aspect of the Opal, Diamonds and Gold, giving it an AAA+ for its EXOTIC Play of Color, NO TREATMENTS, "Translucent Clarity", JUMBO size, excellent design, NEAR COLORLESS VS/SI Diamonds plus overall appeal. Apparently it was only worn for special occasions, is in new condition and just required some very minimal polishing & cleaning. The lucky winner of this ring will have a rare treasure for the years to come. Please see photos of this incredible ring below. 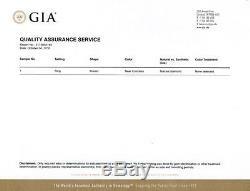 GIA CERTIFICATION GIA DIAMOND QUALITY ASSURANCE REPORT CERTIFIED JEWELRY CERTIFICATION. PHOTOS IN OUTDOOR SUNLIGHT & SHADE PHOTOS WITH INDOOR LIGHTING. Certified Jewelry has been an esteemed leader in fine jewelry sales and service for over 20 years. With a skilled team of seasoned gemologists and jewelry experts, Certified Jewelry has become the preferred source for estate fine jewelry sales and consignments. Our expert staff is well equipped and intimately acquainted with each and every fine jewelry item in our extensive inventory, while being completely apprised of the innate value of each item we offer. Our attention to detail is reflected in every item we sell. We carefully select only the best and finest estate, antique, art deco, vintage & modern jewelry and invite you to experience the Certified Jewelry difference. To Learn more about today's high demand for fine jewelry & precious metals as investments, please see the Fox News video by scrolling to the bottom of this page. Free Ring Sizing Available Upon Request. Most rings can be sized. Items will be inspected by us to make sure they are not damaged or if they have been tampered with. INVESTMENTS YOU CAN WEAR NEWS VIDEO. Thank You For Visiting Certified Jewelry. Attention Sellers - Get Templates Image Hosting, Scheduling at Auctiva. The item "GIA Certified 3.34 ct Natural Black Australian Black Opal Diamond 14k Gold Ring" is in sale since Friday, December 02, 2016. This item is in the category "Jewelry & Watches\Fine Jewelry\Fine Rings\Gemstone". 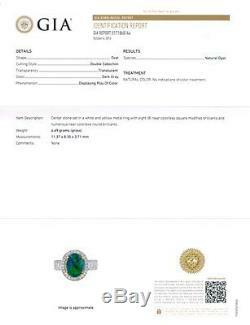 The seller is "certified-jewelry" and is located in Irvine, California. This item can be shipped worldwide.